While we await the Blessed Hope and the glorious appearing of our Lord and Savior Jesus Christ, the blessed in God, Apostle Paul , left us an example of how we are to live our lives. He states, I press toward the goal for the prize of the upward call of God in Christ Jesus, Philippians 3:14. This “Pressing on” by necessity involves maturing in our faith. It is especially important yet sometimes a hard thing for a new believer to grasp this concept, so I often just tell them to find a local Bible believing church, attend faithfully and by all means start a Bible reading program where they can begin to learn as much about Christ as the Lord will allow; after all, it is the Holy Spirit’s responsibility to mature, lead, guide and teach us the things that glorify God and emanate from His throne, John 14:26. That said, it does not give the church a license to skulk away from our responsibility to pray, point and lead them in the right direction. We must be ever vigilant in our own maturity to be there giving true discipleship to God’s new-borns. Obedience is another essential element for advancement. When our desire to obey the Lord is stronger than our attraction to sin, we'll know we are making progress in our spiritual life. In terms of physical development, the goal is to become more independent and self-sufficient as we age. But in the spiritual realm, the opposite is true. Those who are mature in Christ recognize their own inadequacy and rely on the Holy Spirit within them. It's His job to transform our character and empower us to accomplish everything the Lord calls us to do. Brother Stanley could not be more correct. God calls each believer to a life of obedience that is based upon knowing we must submit to the will of God. This point cannot be overstated for our tendencies are to go our own way and practice our own thing. But the Scripture is clear that we were bought at a price, 1 Cor. 6:20, 7:23 and that as Christians we are new creations in Christ, 2 Cor. 5:17. We are no longer to be slaves of men or of the worldly culture created by men of darkness but rather, slaves to God. For the believer, there is no other way to fully take advantage of the riches prepared for us through the mystery God revealed to the world, which is Christ in you, the hope of glory, Colossians 1:27b (ESV). We can strive all of our lives to attain a piece of everything the worldly culture says is good but it will mean nothing in eternity and surely profits nothing for God’s glory or for our spiritual benefit in this life. Instead we will find that in the silver years we have wasted the lifetime the Lord graciously gave to us—one in which He truly desired to give us His spiritual riches, James 1:17. We must ask, "Is that what we really want?" A wasted forlorn life? It certainly is not what God wants. "Come now, and let us reason together," Says the LORD, "Though your sins are like scarlet, They shall be as white as snow; Though they are red like crimson, They shall be as wool. If you are willing and obedient, You shall eat the good of the land; But if you refuse and rebel, You shall be devoured by the sword"; For the mouth of the LORD has spoken, Isaiah 1:18-20. 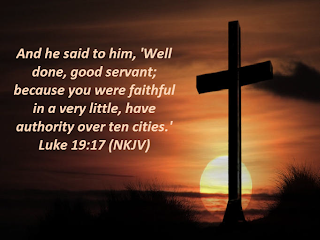 Because he knew that God made the first move—that is He gave us the “Good Gift”—forgiveness of sin and eternal life, then our correct response to God and His gracious actions should immediately induce a grateful attitude that would reflect back to God a life of loving obedience. This obedience would result in the inevitable inheritance of the truly “good of the land.” However, disobedience would result in destruction, not only personally but even as a nation. We could then ask, "What is God’s call for the believer?" Let’s let Solomon answer that. Near the end of his life and after he squandered most of his good years on seeking the answers to life through riotous living here is what he learned, The end of the matter; all has been heard. Fear God and keep his commandments, for this is the whole duty of man. For God will bring every deed into judgment, with every secret thing, whether good or evil, Ecclesiastes 12:13-14 (ESV). This is a great message not just for us average christians but leaders in the various branches of the Vine, brother Mike! The key is Obedience- from it floweth the willingness to be open to His Spirit and then the Fullness of Joy! WOOHOO!! PRAISE GOD! That's what am talking about!